The Aviation Safety Network today released the preliminary 2016 airliner accident statistics showing a very low total of 19 fatal airliner accidents, resulting in 325 fatalities. 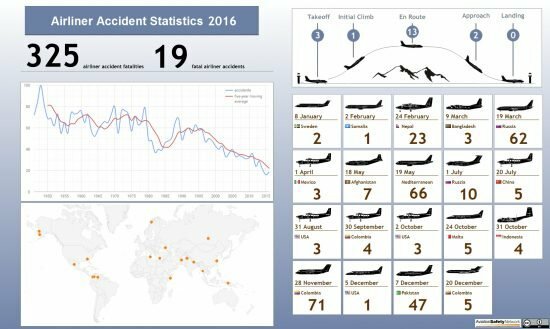 Despite several high profile accidents, the year 2016 turned out to be a very safe year for commercial aviation, Aviation Safety Network data show. Over the year 2016 the Aviation Safety Network recorded a total of 19 fatal airliner accidents , resulting in 325 fatalities. This makes 2016 the second safest year ever, both by number of fatal accidents as well as in terms of fatalities. 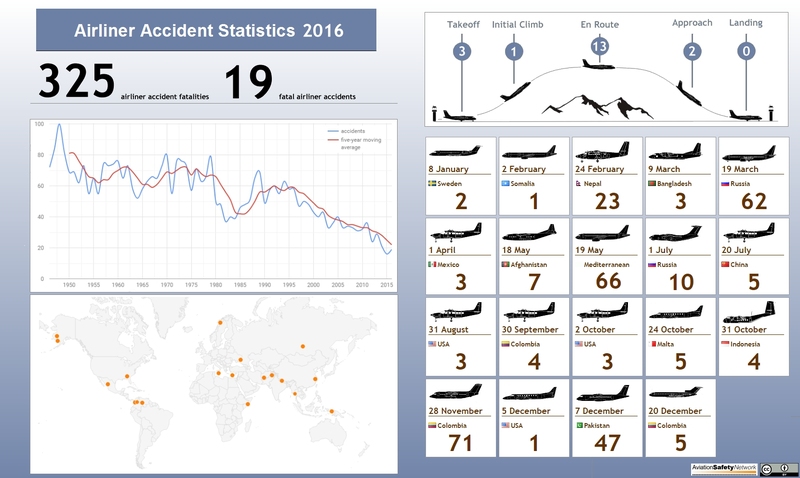 In 2015 ASN recorded 16 accidents while in 2013 a total of 265 lives were lost. Most accidents involved passenger flights (11) . Given the expected worldwide air traffic of about 35,000,000 flights, the accident rate is one fatal passenger flight accident per 3,200,000 flights. The worst accident last year happened on November 28 when a LaMia Bolivia Avro RJ85 crashed near Medellin, Colombia as a result of fuel exhaustion, killing 71. The number of accidents include two likely cases of terrorism. While investigation is still ongoing, the Egyptian authorities stated that they found traces of explosives after the accident of an EgyptAir Airbus A320 that crashed in the Mediterranean Sea in May. Earlier, in February, one passenger was killed when a bomb detonated in the cabin of an Airbus A321 that had just departed from Mogadishu, Somalia. Five-year-average trends show a serious decrease in accidents occurring during the approach and landing phases of flight. The five year average for those accidents is at it’s lowest point in 45 years. Over the last five years about one in three accidents occurred during the approach or landing phase. Two out of 19 accident airplanes were operated by airlines on the E.U. “black list”. Statistics are based on all worldwide fatal accidents involving civil aircraft with a minimum capacity of 14 passengers, as published in the ASN Safety Database. Consequently the December accident involving a Russian Air Force Tu-154 is not included.